Dr. Stalcup is a Radiologist, Dr. Pathria is a Professor of Radiology, and Dr. Hughes is a Professor of Radiology and the Residency Program Director, in the Department of Radiology, University of California, San Diego, San Diego, CA. Certain images and text from this publication were presented as an educational exhibit at the RSNA 2009 meeting. Infection of the musculoskeletal system is commonly encountered in clinical practice. Treatment and prognosis depend upon the site of infection, the organism involved, and the underlying health of the patient. Delayed diagnosis can lead to significant morbidity and mortality, making rapid and accurate diagnosis crucial.1,2 Various anatomic planes can be involved (Table 1). 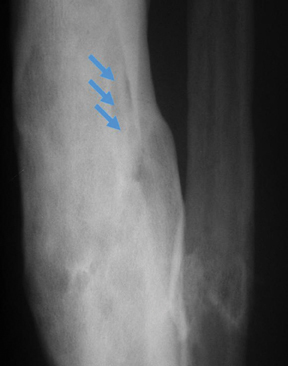 Infection of such tissue layers may coexist or develop sequentially, with osteomyelitis representing the most severe and deepest level. This article will review the imaging characteristics of infection involving the various layers of musculoskeletal tissue, starting in the superficial compartments and working progressively deeper to the bone marrow. Infection of muscle is referred to as “pyomyositis.” In the past, this disease process was most commonly encountered in children and in patients from the tropics; more recently, patients infected with HIV have been recognized to be at high risk for deep muscular infection.3,4,6 Diabetic patients and other patients with vascular compromise or immunosuppression are also at increased risk for muscle infection. The buttock and thigh are the most commonly affected locations, and Staphylococcus aureus (S. aureus) is the most common organism.3,4,6,8 The muscle is typically edematous, partially necrotic, and can contain multiple abscesses. 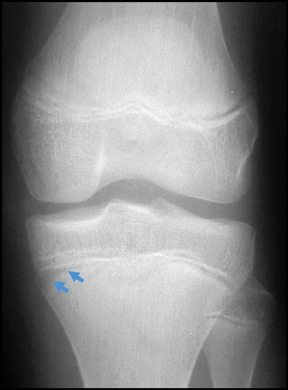 “Septic bursitis” refers to infection of normally existing synovial-lined bursal cavities.12 Deep bursal infection is typically hematogenous, whereas the superficial bursae, such as those overlying the olecranon or patellar tendon, are often infected secondary to penetrating trauma.2 The most common organism is S. aureus,13 and the underlying joint is typically spared.2 Conventional radiographs typically demonstrate nonspecific soft-tissue fullness; gas formation within the bursa is uncommon. 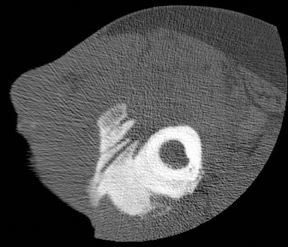 CT and MRI typically show a heterogeneous enhancing well-defined mass in the expected position of the bursa; surrounding inflammation is minimal.5 Septic bursitis can cause adjacent joint effusions, which are typically reactive, but the joint itself can be infected if the ligaments or tendons separating the bursa from the adjacent joint are disrupted.2 Aspiration of an adjacent inflamed joint may be necessary to exclude septic arthritis. 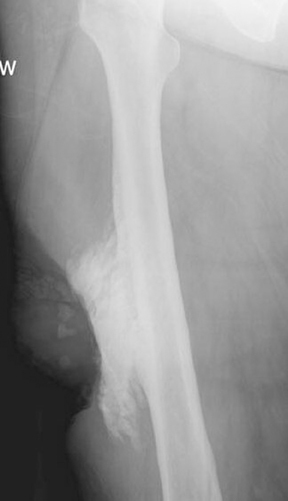 “Infective osteitis” refers to infection of the bone cortex, which can occur independently or concomitantly with osteomyelitis, an infection of the bone marrow.22 In patients with overlying soft-tissue ulcers, periosteal destruction leads to infective osteitis, which precedes transcortical penetration by organisms, and subsequent osteomyelitis.22 Differentiating true infection of the cortex from reactive periostitis secondary to overlying soft-tissue infection (Figure 8) is extremely difficult, as the rad-iographic appearance of these 2 entities overlaps considerably.22 Cortical infection should be suspected if the periostitis is ill-defined and irregular. 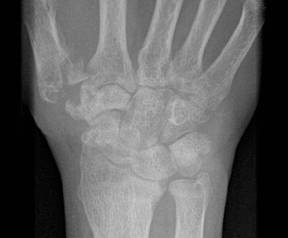 There is intracortical lysis, particularly if the area of lysis is irregular and large, and if a lucent intracortical track leads away from an area of osteolysis.22 Cortical infection can lead to the development of an intracortical abscess, which can simulate the radiographic appearance of an osteoid osteoma6 (Figure 9), although an abscess is generally larger and more irregular. Musculoskeletal infection can involve a number of different tissues, with different imaging appearances, depending on the depth and anatomic extent of tissue involvement. Such infection, particularly in children and in deep tissues such as the bone marrow, can lead to significant morbidity and mortality if not diagnosed accurately and treated appropriately. 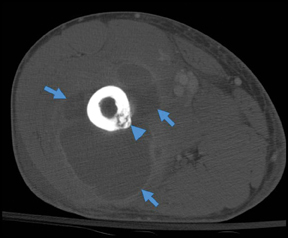 Cases of suspected musculoskeletal infection are commonly encountered by the diagnostic radiologist. It is hoped that this article will aid the radiologist in early diagnosis and categorization of the different layers of tissue involved with musculoskeletal infection. 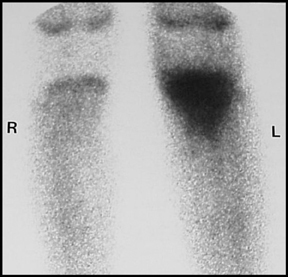 Turpin S, Lambert R. Role of scintigraphy in musculoskeletal and spinal infections. Radiol Clin North Am. 2001;39:169-189. Boutin RD, Brossmann J, Sartoris DJ, et al. Update on imaging of orthopedic infections. Orthop Clin North Am. 1998;29:41-66. Restrepo CS, Lemos DF, Gordillo H, et al. Imaging findings in musculoskeletal complications of AIDS. Radiographics. 2004;24:1029-1049. 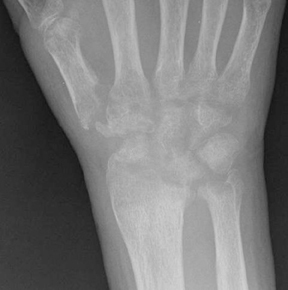 Theodorou SJ, Theodorou DJ, Resnick D. Imaging findings of complications affecting the upper extremity in intravenous drug users: Featured cases. Emerg Radiol. 2008;15:227-239. Lalam RK, Cassar-Pullicino VN, Tins BJ. 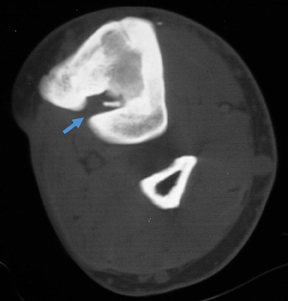 Magnetic resonance imaging of appendicular musculoskeletal infection. Top Magn Res Imaging. 2007;18:177-191. Trent JT, Kirsner RS. Diagnosing necrotizing fasciitis. Adv Skin Wound Care. 2002;15:135-138. Copley LAB. Musculoskeletal infection in children. Curr Opin Orthop. 2005;16:445-450. Resnick D, Niwayama G. Osteomyelitis, septic arthritis, and soft tissue infection: Organisms. In: Resnick D. Ed. Diagnosis of Bone and Joint Disorders, 3rd ed. Philadelphia, PA: W.B. Saunders Company; 1995:2448-2558. Garg RK. Neurocysticercosis: A pictorial review. Infect Dis Clin Pract. 2008;16:210-217. Herfel C, Strub WM, Leach JL. Twenty-four-year-old hispanic man with seizures: Imaging findings of cysticercosis. Infect Dis Clin Pract. 2006;14:93-96. Farooki S, Ashman CJ, Lee J, et al. 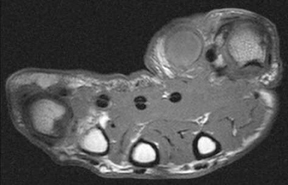 Common bursae about the body: A review of normal anatomy and magnetic resonance imaging findings. Radiologist. 2002;9:209-221. Bureau NJ, Chhem RK, Cardinal, E. Musculoskeletal infections: US manifestations. Radiographics. 1999;19:1585-1592. Smith JW, Chalupa P, Hasan MS. Infectious arthritis: Clinical features, laboratory findings and treatment. Clin Microbiol Infect. 2006;12:309-314. Doita M, Yoshiya S, Nabeshima Y, et al. 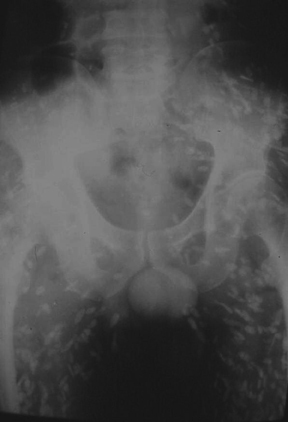 Acute pyogenic sacroiliitis without predisoposing conditions. Spine. 2003;28:E384-E389. Hagan IG, Burney K. Radiology of recreational drug abuse. Radiographics. 2007;27:919-940. Griffith JF, Kumta SM, Leung PC, et al. Imaging of musculoskeletal tuberculosis: A new look at an old disease. Clin Orthop Relat Res. 2002;398:32-39. Hsu CY, Lu HC, Shih TTF. 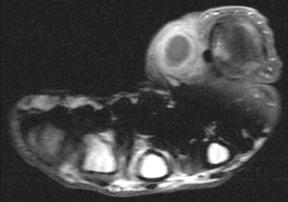 Tuberculous infection of the wrist: MRI features. AJR Am J Roentgenol. 2004;183:623-628. Chau CLF, Griffith JF, Chan PT, et al. Rice-body formation in atypical mycobacterial tenosynovitis and bursitis: Findings on sonography and MR imaging. AJR Am J Roentgenol. 2003;180:1455-1459. 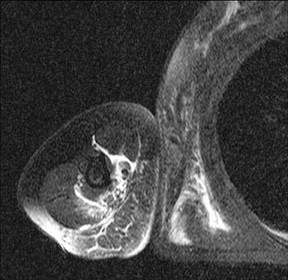 Tan CHA, Rai SB, Chandy J. MRI appearances of multiple rice body formation in chronic subacromial and subdeltoid bursitis, in association with synovial chondromatosis. Clin Radiol. 2004;59:753-757. Karchevsky M, Schweitzer MR, Morrison WB, et al. 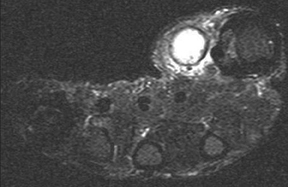 MRI findings of septic arthritis and associated osteomyelitis in adults. AJR Am J Roentgenol. 2004;182:119-122. 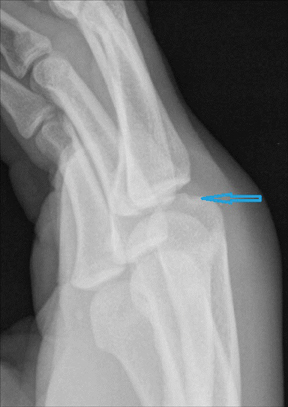 Resnick D, Niwayama G. Osteomyelitis, septic arthritis, and soft tissue infection: Mechanisms and situations. In: Resnick D. Ed. Diagnosis of Bone and Joint Disorders, 3rd ed. Philadelphia, PA: W.B. Saunders Company; 1995:2325-2418. Auh JS, Binns HJ, Katz BZ. 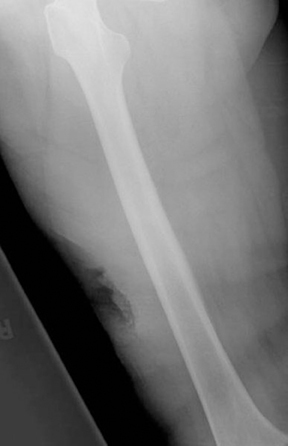 Retrospective assessment of subacute or chronic osteomyelitis in children and young adults. Clin Pediatr. 2004;43:549-555. Smith J, Mello LFB, Neto NCN, et al. Malignancy in chronic ulcers and scars of the leg (Marjolin’s ulcer): A study of 21 patients. Skeletal Radiol. 2001;30:331-337. Musculoskeletal infections of the extremities: A tour from superficial to deep. Appl Radiol.